The reconstruction of the Circle Interchange (I-90/94 at I-290) in downtown Chicago — renamed the Jane Byrne Interchange after the former mayor of Chicago who passed away in 2014, has reached the midway point. 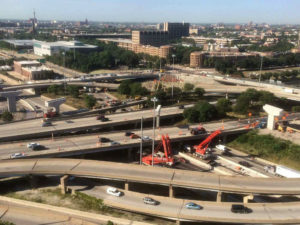 The Ramp NW Flyover project includes a new flyover ramp to connect the northbound Dan Ryan (I-90/94) to westbound Eisenhower Expressway (I-290) movement. The work being done by McHugh Construction, which began the project in October 2014, will be completed in March 2017. The existing ramp, beneath the new one, which spans the entire circle, will be demolished after the traffic is shifted to the new infrastructure. The interchange is adjacent to the west end of the central business district, Greektown to the northwest, and the University of Illinois at Chicago to the southwest. Built in the late 1950s and early 1960s, the interchange links to the Dan Ryan Expressway (I-90/94) to the south, the Kennedy Expressway to the north (I-90/94), the Eisenhower Expressway (I-290) to the west and Congress Parkway to the east. It has been nicknamed “the circle” as the curving ramps appear to form concentric rings. “The Circle Interchange is critical to the nation’s transportation system, particularly for freight movement on our Interstate and arterial roadways, as well as to regional railroads and waterways,” according to the project Web site, “[and] serves as a vital hub for local, regional, and national freight traffic. Truck traffic has grown and has a far more significant impact on roadway capacity, levels of service and traffic delays than the 5 percent truck traffic that existed when the Interchange was originally designed. It took two years to prepare the planning (Phase 1) and design (Phase 2), an initiative financed by IDOT’s 2014-2019 Multi-Year Highway Improvement Program. The construction phase (Phase III) is being implemented in three stages. The First Stage (Cross Road Bridges) was the Morgan Street Bridge project (F.H. Paschen/S.N. Nielsen, Inc.), which included the reconstruction of Morgan Bridge over I-290 and CTA Blue Line, construction of retaining walls, relocation of existing water main and sewers, traffic signals, and roadway lighting. This was completed on October 6, 2014. 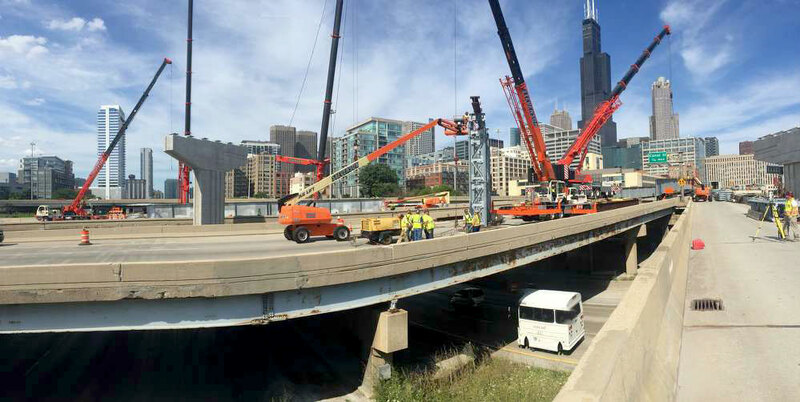 The Second Stage (I-290/Congress Parkway), awarded to Kiewit Infrastructure Co., involved the complete removal and replacement of the existing bridge structure which carries Peoria Street over the Eisenhower Expressway (I-290). This has been substantially completed. The Third Stage (the I-90/94 segment) has two contracts, with one awarded to Walsh Construction, which requires the complete removal and replacement of the existing bridge structures on Harrison Street “West” Bridge over the Southbound Dan Ryan Expressway (I-90/94) and Halsted Street Bridge over the Eisenhower Expressway (I-290). The Ramp NW Flyover work has crews engaged in the construction of a new two-lane ramp and bridge that begins just south of Roosevelt Road on northbound I-90/94. The bridge —two 12-ft. (3.6 m) wide lanes with 10-ft. (3 m) inside and outside shoulders — crosses Harrison Street, I-90/94, I-290 and Halsted Street and the flyover ramp ends near Morgan Street on westbound I-290. The length of the improvement is approximately 1 mi. (1.6 km), of which the flyover bridge is approximately 2,000 ft. (609 m) long. “Construction of Ramp NW Flyover will serve as a critical step in improving the Circle Interchange’s overall safety, capacity, and geometric deficiencies,” according to the Web site. The work also requires the removal and replacement of some existing retaining walls, construction of new retaining walls and construction of noise abatement walls on the north side of Ramp NW between Halsted Street and Peoria Street and between Peoria Street and Morgan Street; partial construction of the Roosevelt Road entrance ramp to northbound I-90/94, Ramp NE and westbound exit ramp to Morgan Street; and vibration monitoring for the existing buildings along I-90/94 between Taylor Street and Harrison Street, and along I-290 between Green Street and Morgan Street. Other elements include drainage; interstate lighting, underpass lighting and high mast interchange lighting; signing; traffic control and protection landscaping; urban enhancements; and pavement markings. Traffic control is critical for the successful completion of the new ramp, and this includes various closures and detours to give construction workers safe places to work. But the impact of traffic is much deeper and not just for McHugh Construction. “This is one of the largest traffic jam areas in the country,” said Harmon. “Staging in the design allows us to do our work and bring in materials and equipment, but it’s a challenge because in every direction you’re coming off a live interstate trying to merge into your construction limits. We do night work if there are certain activities that require lane closures. Careful and serious planning and execution ensured the success of the work. On an average day there are between 14 to 20 McHugh employees on site, along with a similar number of subcontractor personnel. The number is smaller due to constraints upon progress that could be made. To complete the contract, McHugh needs to erect steel on two units — about 600 ft. (182.8 m), place about 1,200 ft. (365.7 m) of bridge deck, and construct the entire west side of the job, which was delayed due to work on the other contracts. McHugh’s planning team has been flexible in dealing with challenges and preparing revised schedules to maximize work times. This is important because the contracted delivery date of July 31, 2016 has been extended due to the delays. IDOT, said Harmon, appreciates and understands the challenges that McHugh is facing and is working with them to iron out problems. “Our immediate goals are to complete the bridge piers and retaining wall, erect the structural steel, and place the bridge deck,” he said. The major subcontractors hired by McHugh are Danny’s Construction for steel erection; LJ Keefe for jack and bore of precast concrete sewer; Clausen Structures for installation of reinforcing steel; Chicago Structures for precast retaining walls and light-weight cellular concrete fill; Traffic Services Inc. for traffic control and traffic stage changes; and Michels Foundations for caisson installation. Materials being brought in for the work are: 6,900 cu. yds. (5,275 cu m) of concrete, 4.8 million lbs. (2.1 million kg) of structural steel; and 2.5 million lbs. (1.1 million kg) of rebar. The steel beams — ranging from 48 to 90 in. (121 to 228 cm) deep, a plate girder system, were fabricated in Gary, Ind., and have been delivered to McHugh. Materials are brought to the site on “as needed” basis due to the constraints, which has steel beams lifted off the trucks and immediately set-in-place. Minimal handling of materials is essential due to lack of space for onsite storage. The tight site also limits the amount of equipment that is being used, which includes smaller RT cranes; Tadano 55 to 75-ton (49 to 68 t) cranes for pier construction; and large hydraulic Liebherr 300 and 500 cranes for structural steel installation. With so few pieces of equipment, mechanics are brought in as needed. 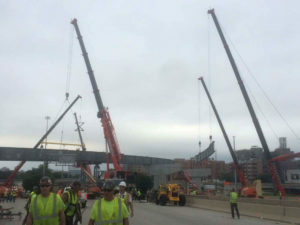 “We have not had any significant equipment issues on this job,” said Harmon, who added that the company rents equipment from dealers such as Stevenson Crane Services in Chicago, Ill., Chellino Crane in Joliet, Ill., and O’Leary’s Contractors Equipment and Supply. 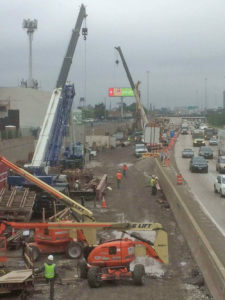 McHugh Construction has delivered many bridge projects for IDOT.